I’ve been blogging for less than eleven months now and in spite of my not churning out posts on a daily basis and infrequent visits to other people’s blogs, you, my readers, have remained loyal. So it came as quite the surprise to me that in the past little while I have been given not one but two awards. … it would be nice if they added to the “Top Posts” stats page more stats, like the number of words, comments, and photos therein, as well as the ability to toggle each field to order the data as one finds useful. It would also be nice if we could display photos in the Media Library as a full-page grid… it takes forever searching through pages and pages of tiny thumbnails in the present one-per-line list. 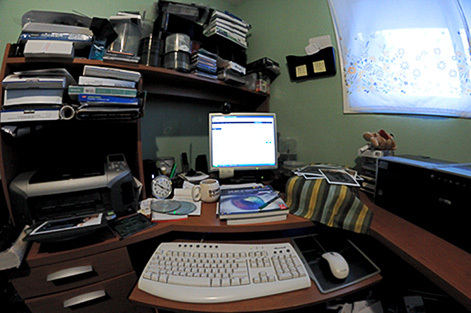 A photo of my home work environment taken while I was slapping together this very post. The two printers at the sides of this image had very little to do with it but the monitor, the mouse, the keyboard, and especially the coffee were central to getting this post up and to the people. First of all, I would like to break from the tradition began by similarly illustrious awards, such as The Academy Awards, The Golden Globes, and The Darwin Awards, by starting my seemingly endless babble by thanking those I wish to thank for making me thankful for this distinction that thanks me for the thousands of thankless blogging hours I’ve put in, sometimes just typing up a single post. I would first like to thank Badlands Badley for nominating me. Nathan was the very first person to comment on my blog, encouraging me only 33 days after hitting the publish button on my groundbreaking “Hello World” post with his kind words reassuring me that using that default title was “undoofuslike”. 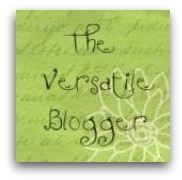 When it Rains, it Pours… Another “Versatile Blogger Award”! I have been given another Versatile Blogger Award, this time by Dark Pines Photo whose photos are sometimes dark, sometimes have pines in them, but are always works of singular creative genius. Today “The Versatile Blogger Award”, Tomorrow the Stars! My sucking up to the upper crust of WordPress society has finally paid off — I am the most recent recipient of The Versatile Blogger Award!